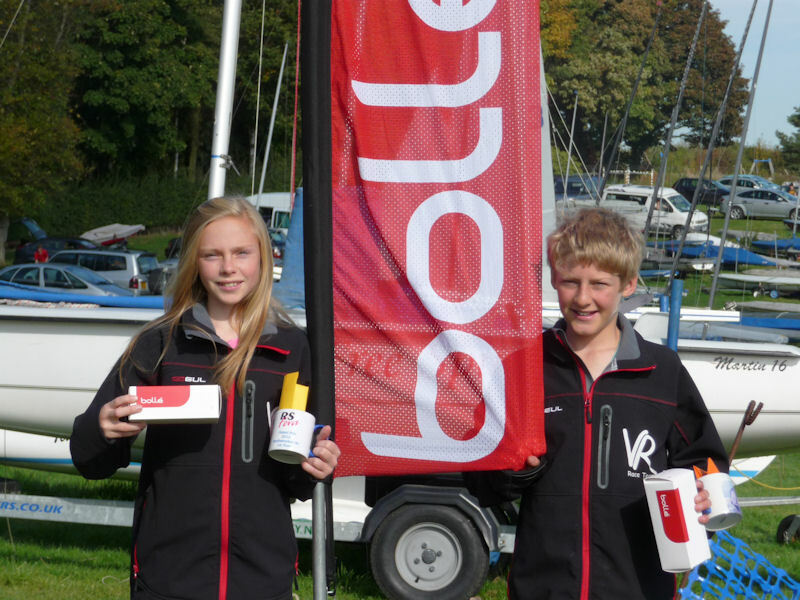 The Bolle RS Feva Grand Prix was hosted by Northampton SC on October 6/7. The event was the second GP in the national series & the final selector for many of the winter squads. RS Feva Class Secretary, Debbie Darling, learnt to sail at NSC and was happy to take on the role as PRO for the weekend. Some families arrived on the Friday evening and had to endure torrential rain keeping them awake in their campervans and tents, but Saturday dawned beautiful and sunny with a light NW 4 – 8 knots of breeze. With a forecast of no wind for Sunday the fleet was advised that 4 races may be sailed. After a short 10 minute postponement the 45 boat fleet got away. There were big shifts across the course & at times the boats on either side of the course were looking good & laying the windward mark. In the end it was Robbie King & Will Bedford leading at the first mark only to be overtaken by Max Matthews & Guy Rivington by the leeward mark. These positions held to the finish with Arthur Brown & Niamh Davies climbing to 3rd. The line stayed heavily port biased for the 2nd start and with the majority of the fleet wanting to take the port end a recall came into play. A right hand shift just before the restart left one boat black flagged whilst the rest of the fleet tried to pick their way up the tricky, shifty, patchy course. At the windward mark it was Jamie Jobson & Eve Gadd leading from fellow RTYC sailors Ben Hopper & Larissa Connabeer with Wills Murray & Will Ormerod 3rd. The 'snakes & ladders' conditions continued with new leaders by the top of the 2nd beat. Arthur & Niamh in first, then Jamie Smith & Piers Nicholls 2nd with Jamie & Eve 3rd. By the finish Arthur & Niamh had extended their lead with Harvey Martin & Will Ward climbing to 2nd. With the wind becoming even more patchy, and rafts of boats getting 'stuck' at the windward mark, the Race Officer pulled the windward mark further away from the shore, this shortened the course and allowed time for a fourth race, if possible. Race 3 started all clear with many boats trying to get over to the right to find the breeze, only to find the wind had filled from the left. Confident in the tricky conditions were Arthur & Niamh who lead at the windward mark from Tom Darling & Will Dolin, with Wills & Will in 3rd. By the end of the 2nd beat Arthur & Niamh had extended their lead from Tom & Will who battled to keep ahead of Wills & Will when their pole rope broke and they could not fly the kite. At the finish it was Arthur & Niamh with a huge lead; 2nd Tom & Will with Wills & Will in 3rd. For race 4 it was Robbie & Will leading at the first mark from Flynn & Henry in 2nd, with Libby & Harriet in 3rd. Wills & Will flew into the lead downwind, ahead of Libby & Harriet in 2nd whilst Arthur & Niamh climbed through to 3rd then up to 2nd on the next beat. Race 4 was won by Will & Wills; 2nd Arthur & Niamh with Libby & Harriet 3rd. Sunday arrived foggy & calm. When the sun broke through it was clear that the forecast of 0 knots would hold true & racing was abandoned for the day. This gave overnight leaders Arthur and Niamh the overall win with 4 points. Harvey Martin & Will Ward sailed consistently to take 2nd place from Robbie King & Will Bedford.